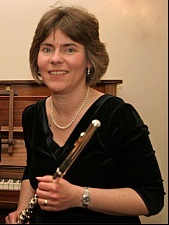 Julie is a flautist with over 30 years’ experience. She holds a B.Mus (Hons) degree from Royal Holloway, University of London, and Diplomas in Flute Performance and Flute Teaching. She enjoys teaching flute, piano and music theory to adults and children alike. Julie plays flute with Clacton Concert Orchestra and is Musical Director of All Saints’ Church, Great Oakley, Essex. Saw you play at Melford church, only caught last piece, but thought it was amazing, and beautifully played. Do you have a cd with it on?